What is going to be the most important ranking factor? What’s your best SEO prediction for 2019? What SEO truth or technique have you learned recently that worked like a charm? And the answers are full of actionable tactics that can skyrocket your organic traffic and help to generate more leads to your business. We’ve collected some nutshell answers for each of the questions as we got from the masters of Search Engine Optimization. We know there are more than 200 ranking factors but here are the most important ones on which you should be more focused. Authority Links: Links are still on the number one Google and other search engine ranking factor and a parameter to determine the trustworthiness of a website. Links seems like the recommendation, so higher the number of authority links pointing to your site, the more credibility your site hold, and higher ranking in the search results. High-Quality Relevance Content: Relevant and a masterpiece is the only thing that Google all want from the webmasters which perfectly satisfy the user’s search intent in terms of the web content. Optimize your content for voice search targetting long tail keywords to rock SERP and get tons of free traffic to your website. Site Speed: Make sure your site loads faster because of the extreme impatience of the searchers who looking for quick information. It’s even more important for your improved UX, lower bounce rate, higher ranking, increased conversion and great customer happiness. Heard so many blah blah predictions for SEO but still confused what will be the right ones that will keep rocking this year. Increased Voice Searches: Everything is moving to voice searches now with the increasing popularity of technology like Google Home, Alexa, Siri. Optimize your site for voice searches to kill the competition and see huge growth in your organic traffic. Reduced Organic Reach: Yes, you read it right! Organic reach will decline as the increased number of ads & losing the real estates of the SERP the number 1 position to the featured snippets, Q&A boxes as they’re going to be seen on the top in almost every search query. Semantic SEO: As per SearchEngineJournal Semantic SEO is the process of building more meaning into the words you use in your content. This means optimizing for the true intent of your users, not just answering a simple query. It means you answer the first question and then immediately answer the second, third, fourth, or fifth question right after that. SEO heck changes over time, some working well last year but not working now! Here are few top SEO techniques working nicely. Updating Old Content: “Old content is your money content”, yes you heard it right. If your blog getting a handsome amount of organic traffic then you can try updating your old blog posts with adding more graphics, adding more keywords, changing titles & meta, adding extra internal links, and few more instead of publishing new content to grab more traffic from both the hands. Proper Internal Linking: Internal linking done in a correct way improves your topical authority and can help you to grab higher ranking for your targetted keywords. By adding the internal links you make sure the search engines properly understand the relevance of the pages, the relationship between pages and the value of pages on your site. Perfect SEO Recipe: Quality content, plenty of strong backlinks and the right keywords are the basic but essential SEO cookie elements. Just make sure you choose the right keyphrases then craft some killer content that provides the idle answers to searcher’s query and at last build relevant and string backlinks for the page. Ans 1: User experience and on page time will matter the most. Gone are the days someone can just stuff keywords and get backlinks and rank any web page. Google picks up on the user engagement from the point of the person click to the web page, that’s why new pages pop to first page in few days of putting it but drop if the on page metrics are bad. Any website should work smart to increase the user engagement signals. The goal should be to give the best web page on a particular topic/s. Ans 2: Voice search will grow. So optimize for voice searches. Ans 3: Get your website on a dedicated cloud hosting if you are serious about giving the top notch performance for your website. Page speed matters when it comes to mobile rankings. One more thing I’ve realised is that hosting the business website on a servers based in the same city helps. Have CDN setup so multiple users can experience the website at the highest performance. Ans 1: Topic relevancy and clustering (hob and spoke model) are what one should be aiming to ace it in 2019. Ans 2: UX signals will become more prominent and Google will keep stealing traffic with their featured snippet. Make sure to optimize featured snippet to rock page 1 of the search engine. Ans 3: Optimizing content based on what Google thinks is the idle answer for a query has made a lot of difference for us in recent time. Google search console data + top search results are the key to advanced on-page SEO. Ans 1: Search intent. Even looking back at 2018, I see that many of the huge shakeups following algorithm changes have had to do with Google defining clear buckets of queries that pages can rank for. Whereas before you could rank a single page for “___ review”, “benefits of ___”, “where to buy ___”, it seems like Google is rolling back from their one-size-fits-all preference of long form content, and more into the granular. How to beat it? See what kind of content Google is already ranking for the query you want to rank for. Ans 2: Not much will change. The same ranking factors will be the dominant ones. People aren’t all going to start searching with Google voice. Etc. What you can probably count on though, is that we’ll continue to lose page 1 real-estate to ads and other features. Ans 3: I’m mostly focused on affiliate SEO with my personal projects. But even at my agency, The Search Initiative, we seem to attract a lot of affiliate clients, in addition to the e-commerce and local folks. I didn’t notice this until late 2018, but with affiliate sites, the balance between the amount of commercial vs informational content has become more critical. Write too much info content, and Google “themes” you away from being a review site. You need to find that niche-specific sweet spot. Ans 1: Links… Quality links will always be an important ranking factor in 2019. Starting a blog and taking it to the next level are 2 completely different things. Anyone can start a blog these days by reading many online guides. But ranking it in search engines will take your efforts which ultimately summarize as building the backlinks. Finding quality placement for your backlinks will be a big win in 2019. Ans 2: Everything is moving to voice search now. Amazon Alexa, Google Home, Apple Siri and there are many other voice search devices available in the market right now. People want quick and to-the-point answers. So optimizing your site as per the voice search queries will be a big win in 2019. Ans 3: The relevancy of your backlinks will always win over the quantity of the backlinks. 5 relevant backlinks are way better than 50 non-relevant backlinks. In-depth knowledge about the content will take you to the next level because no one is putting that amount of efforts to produce quality content these days. As Google is continuously improving its algorithms so having better content will always be a big win. Ans 1: There are a variety of factors that have seen its share of increased importance during 2018. Some of them include the switch to HTTPS and Mobile-first indexing. Much like how these factors came about with the increase in the usage of mobile phones for search, one of the most important ranking factors for 2019 will likely be influenced by the trend last 2018 – voice search. Optimizing your content for voice search – targeting long tail keywords – will help your website be noticed by Google as one of the authorities for a specific niche because if you optimize your site content to answer specific queries (long tail keywords) and featured snippets, you’ll have higher chances of increasing your reach/audience. Ans 2: As I’ve mentioned, 2019 will see a shift in focus, especially in how SEO specialists approach long tail keywords. More pages or posts will attempt to answer user queries for different niches. Aside from this, more and more webmasters will optimize their sites for mobile since more than half of the pages displayed by Google globally are now using mobile-first indexing, which is expected to rise this 2019. Ans 3: That content is still king and a proper and finely tuned content strategy is one of the most important aspects for succeeding in SEO. Publishing more informative and comprehensive content will help in ranking higher. By simply increasing our monthly blog post comprehensiveness and other factors, we managed to enter Google’s first page and stay there for a few months now. This reminded me that sometimes, the most effective strategies are the simple and easy ones. We don’t always have to rely on complicated and technical strategies all the time and this is, what I believe, separates the good SEO specialists from the great. SEO specialists that know when to use simple and easy strategies and when not to rely on complicated, technical-heavy strategies which can only be gained from years and years of experience and knowledge building. Ans 1: I’ll cheat and say two factors: backlinks and content as they’ve been the main factors since the beginning of SEO. Content and high quality content will be more important as Google gets better and better at sorting through the internet. After the EAT Series of updates, it’s clear there are a lot of factors involved, many related to having great, accurate, and helpful content. Ans 2: The searcher intent will be more and more important. This will come into play a lot when you think about voice search and the growth in smart home space. Amazon Echo, Google Home, and Siri are trying to find concise and accurate answers for voice searchers. So long form content is great — when it needs to be long form. But short form content is just as important when you think about the searcher intent. My advice is to have a short answer within a thorough, longer piece of content to provide something quickly to a voice searcher. Ans 3: Going after long tail searches even with low search volumes can be worthwhile. Usually, you’ll be able to rank a low volume keyword, i.e. under 250 searches per month, faster than a term than a higher search volume. There’s normally less competition, too. Sometimes people get nervous when targeting a term with a search volume of something under 100 searches per month, but we need to remember that search volumes are an estimate. So if you end up ranking long tail term, you might rank for other terms that are even more obscure so you end up with far more traffic than you would have predicted. Ans 1: Optimizing your websites for voice search is definitely going to be the most important newer ranking factor to consider in 2019. Consumers are purchasing and utilizing Amazon Alexa, Google Home, Apple Home Pod, smart home tech and other voice-activated media more than ever before. Your website, content, and keywords need to start reflecting that. Keywords will often time be long-tail and conversational instead of a few words. Your writing should reflect how people actually speak, especially how they ask questions and expect answers. Ans 2: Voice is going to get even bigger, which will change the SEO world a great deal. And most voice searches are done on mobile so voice search engine optimization must be mobile-friendly. Websites that aren’t mobile friendly, slow loading, and without an SSL certificate will continue to plunge in PageRank in 2019. Ans 3: The SEO truth that I keep realizing is that the basics are still the most important. It just comes down to quality content, plenty of strong backlinks and the right keywords. So many SEO experts have said that building backlinks or publishing more content isn’t that important any longer, but these staple strategies are essential. It’s just a matter of doing it well at scale and specific to your industry. Don’t get caught up in all of the small details, focus on the big picture! Ans 1: The two most important ranking factors historically will continue to be the two most important ranking factors in 2019: authority (links) and relevance (content). Some things never change! The website has to be credible and the content has to align with the topic and intent of the visitor. I don’t predict any change to this anytime soon. These trends will continue to become more important …but there is nothing more important in search than authority and relevance. Ans 2: Reduced organic reach. Bad news, I know. But Google is always learning new ways to keep visitors from clicking. They fill search results pages with featured snippets, Q&A boxes and anything else that pulls attention away from the blue organic links to our content. Click through rates from Google will continue to decline, but don’t get discouraged. There are so many opportunities to make great content in low competition topic areas. Smart SEOs will end 2019 with more organic traffic. Even if the traffic from each keyphrase declines, they will have higher rankings for more phrases. It’s worth fighting for and there are plenty of chances to win. Ans 3: Stop writing new articles and start updating old ones. If you’ve been at this for a while, you probably have a lot of URLs that have been linked to, but the articles are old and not all that relevant anymore. Each of these is an opportunity. If you rewrite the article (don’t just tweak it) then you have a head start in search because the URL already has authority. Once you give it an overhaul, it will have both authority and relevance. Bingo! The rank should jump. A lot of bloggers are beginning to discover this. We asked 1000+ bloggers if they update older articles. We also asked if they get “strong results” from their content. Here is the correlation. 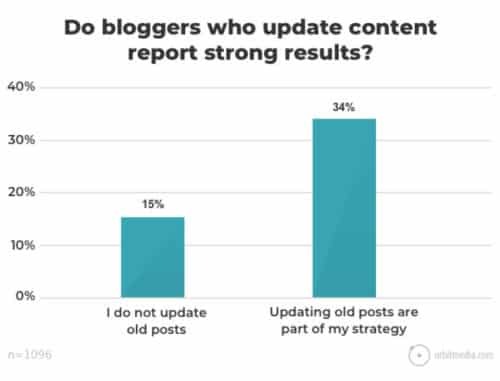 Bloggers who update older content are more than twice as likely to report strong results from their marketing. Ans 1: Google has been focused on user experience for a long time and if site owners have already checked off all the obvious optimization tactics, they need to focus on the more ambiguous and challenging tasks like improving CTR from search results pages and dwell time on their site. Google pays attention to those signals from users and recent algorithm updates have targeted sites that have thin, topical content with little in the way of deep, helpful information from users (https://searchengineland.com/freds-losers-sistrix-analysis-says-ad-heavy-thin-content-sites-hit-worst-272199). All businesses have their service pages and there’s only so much you can do with those in terms of ranking them but producing long-form, blog content is necessary for ranking on the first page for competitive keyword phrases. This is especially true in law firm search strategies where firms are attracting people via blog posts and then funneling them to practice area pages. The winners in 2019 will be those businesses that produce the very best content on a given topic area and that is far better than the competition in the eyes of users. Ans 2: It may take longer to rank on the first page of Google search. Good SEOs know that ranking a page in Google takes a while. 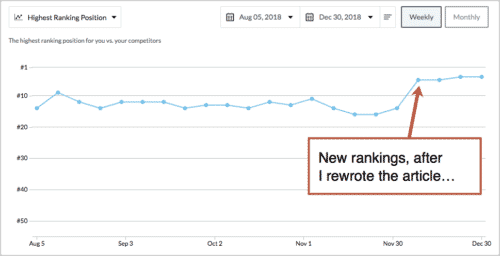 Under the best circumstances it can take 4-6 months to rank on the first page for a competitive term (give or take some time depending on how competitive the phrase is). A study by Ahrefs (referenced here https://ahrefs.com/blog/how-long-does-it-take-to-rank/) reported that the average page in the top 10 results of Google search was about 2 years old. Now that doesn’t mean that all of those pages that landed in the top 10 spot in their study had aggressive SEO campaigns behind them but it helps shed light on Google’s underlying goal of showing users the most reputable, useful content relevant to a searcher’s query. Content that has been tended to over the years and been shared and/or linked to over that time tends to be more authoritative than content that has just hit the scene. Therefore newcomers to an industry may have to be patient even if they are working full speed to rank for a keyword phrase. Ans 1: All current SEO rules will apply, I don’t think there’s 1 thing that sticks out as a major change in ranking factors. I do believe that there are continuous growth and overlap of UX and SEO, I believe we will see a lot more investment into UX initiatives that ultimately fall under the scope of SEO. Ans 2: Same as the previous year – there are no new tactics for SEO, it’s all about putting in the work and executing on what you already know to work. Ans 3: None – there are no magic tricks or shortcuts. You know what it takes to rank an SEO now, you just have to put in the work. Ans 1: Picking one ranking factor over others is always a mug’s game. I think what we will see over the next couple of years is Google trying to satisfy user intent. As more and more Internet use comes from the Internet of Things, Google needs to be ready to understand what each user is looking for. Information? Purchase? Entertainment? Records? Ans 2: This is not so much a ranking factor, as it is a direction. It will become increasingly important for web pages to tell Google what the page does, not just what it is about. That means that using schema will grow more important in 2019 and in the next few years. Ans 3: The logical prediction from this is that pages will start to rank better for some types of searches than others, depending on the presumed user intent of those searches. To what degree that will happen in 2019, I do not know. But I suspect that it has already begun, given that Google’s AI division was set up a year-and-a-half ago. Ans 1: I believe the most important ranking factor is going to be page site speed. Google likes to show fast-loading websites to its users. This relates to your third question what truth did I discover that works like a charm. The truth is the most important ranking factor in 2019 will be page speed. I pride myself on my ability to research keywords which will generate a great deal of organic traffic to my site. I’ve studied SEO for 4 years. When my site loads faster, my organic traffic is better. When my site loads slower, my organic traffic is worse. I’m the same person with the same knowledge and skills regarding SEO. What’s the only different variable? It’s site speed! Ans 2: Google still likes to see relevant links to your articles. The more well-rounded your link profile is, the better you’ll do in Google’s SERPs. Ans 1: The key ranking factor will be helpful content. SEO is content-based. Good, aligned, rich, problem-solving content fuels the SEO engine. Write helpful content. Be practical. Be generous. Ans 2: Google will force you to build genuine friendships based on service to build organic backlinks. Neil Patel has been doing this for years, linking to folks like me multiple times, without asking for anything in return. He has been richly rewarded. Build links through service, not self-service. Ans 3: Be social. SEO geeks sometimes get lost in details, trying to game the system. I have been social, linking to blogging buddies and asking for nothing. All the organic backlinks I get from friends linking out is boosting my SEO juice substantially. Link to people. Publish quality content. Nab quality backlinks, organically. Ans 1: In 2019 links will still be the most important ranking factor. Not in regards to who has the most, but who has more relevant links from reputable sites. Ans 2: I think 2019 will see an even more increased focus on voice search. With the increasing popularity of technology like Google Home, Alexa, etc. the use of voice search will continue to rise. So it makes sense to put efforts towards ranking for voice-related searches. Ans 3: One technique that has been working really well is an in-depth content audit. By removing, purging, or even updating existing content you can see drastic results rather quickly instead of starting from scratch on a new blog post. Ans 1: High-quality content that naturally attracts links. It’s the ONLY evergreen strategy that works like a charm no matter which year it is. Yes, there are over 200 ranking factors that Google uses to rank a page but content that attracts links is the best ranking factor which works great for any kind of website. Ans 2: I think 2019, you’ll see a lot more changes related to voice search. People are using voice search so if your content and website are properly optimized for voice search results, you’ll definitely see a huge traffic growth. Ans 3: Creating FAQ sections is working well. Also, getting Google featured snippets is easy if you try to answer users queries directly. Make sure to find questions that your target audience might type in Google search and answer those questions through your blog posts. Ans 1: Quality. Be the best. Clearly, demonstrate you are the best. Make that your mantra and everything else you do from an SEO perspective just gets so much easier. Sure, you still need to ensure your site is sensibly optimised but by making sure you have the best answer to a given question you deserve to rank, and when you deserve to rank then you have the foundation for success. Ans 2: Focus on building a brand and being an authority. This can happen at a micro (local business) or macro (international business) level. If you are a local plumber then ensure you have the best exposure and that you have the best information, reviews, case studies, testimonials – do everything well. If you are an international business then focus on having the best answers to all relevant questions your customers and target audience may have during the buying cycle – be the authoritative voice in your space. Work with a brand mentality and everything else gets easier. I like the idea of super credibility and how this can be applied to SEO. Ans 3: In 2019 and beyond there is no SEO secret sauce. There are no magic hacks or techniques. Good SEO, in competitive industries, is always about hard work. My advice here would be to stop looking for the magic and start doing the work! At Bowler Hat (my agency), we still speak to people every single week, typically small business owners, who are looking for that secret. Spending hours trying to find that one magic technique that will rocket them to the top of the page. Stop that. It’s a waste of your time (and mine). Spend that time doing the work and you will see the benefits. If I had to give one piece of advice it would be to do the SEO basics really well. Ans 1: Link signals will continue to be a top priority for ranking & likely the most important/influential signal (overall) in 2019. I also believe that Google will continue to get better at deciphering whether or not a link is valuable through qualitative analysis of the site, content & context. So gaining links from quality sources that move the needle will become more & more refined & difficult. Ans 2: I believe that page quality, authority & thus page length are going to become more important than they already are. It’s likely that one thousand words or more will become standard for about any page you’re trying to rank for nearly any keyword in any market. Increasing images, video & possibly other forms of media on the page may increase in importance as part of this. Ans 3: It seems that gaining links within content written to a higher standard/authority is increasingly influencing the effectiveness of those links. In addition to that, it also seems that the value of a link is being more heavily affected by the words around the anchor text itself. In fact, controlling keywords around the anchor text is probably much safer than controlling (& potentially over optimizing) anchors directly. While neither of these insights is a new concept, I believe that capitalizing on them is becoming increasingly effective. Managing those two factors are often undervalued/overlooked by SEOs. Ans 1: I think I almost said this for 2018, but still, for 2019, it will be all about the devices you carry with you all the time. Along with that, I believe AI is going to make a tremendous change as well. Start to use Alexa, Siri, and Assistant and see how they grab information online. See why your blog is not a part of that already. If Google can finalize that your content is optimized for all the possible mediums in a fast and updated (freshness) way, then that’s going to be a powerful ranking factor I believe. Ans 2: Lately, whenever I Google, I find myself getting all the answers on the Google SERP page itself. As a desperate searcher, I find this way too helpful but as a content producer aka blogger I’m in a dilemma, like, how exactly I can outrank Google. Implement all the practices suggested by Google. Have a look at their “Structured data & rich snippets” and check whether you are following everything correctly. If you are going to convey this “Yes” answer in the SERP description itself, then people who see your article on SERP will get the answer and go right away, which is actually somewhat good, but the problem is they will never know why we mentioned “Yes” and what are the factors/facts which supports this answer as well. Never reveal everything in the description, your complete article should be their final destination. Ans 1: Search intent. I’m still not fully convinced E-A-T is part of the algorithm, but search intent, and how Google learns more about it, is going to be huge. Ans 2: Ha, I guess I already answered this above. Google will focus more and more on matching searcher’s intent, and they’ll get a lot better (thanks to machine learning) at identifying it. The SERPS will probably become more volatile as a result. Ans 3: I’ve not tested it fully yet, but TF*IDF is looking promising. Ans 1: Content and backlinks both are important ranking factors in 2019. To maintain ranking positions in Google, we always need to make quality backlinks for our blog/website. Since our competitor is not sitting they are putting efforts continually to boost their ranking so if we stop after acquiring good ranking positions, we are going to lose sooner or later. Ans 2: Always write better content that adds value to your users, don’t be hurry to finish the article. Go for quality, not for quantity. Always ask a question to yourself how you can make your content better than others. Updating old posts (optimizing content, write a better intro section) and proper interlinks worked like a charm for me. It helped me to increase my organic traffic a lot. Ans 3: SEO is all about basics which mostly newbie ignore. They always look for advanced techniques and SEO tips. There is no magic SEO strategy which will take your blog to top in one night. Once you learned SEO basics (keyword research, on page optimization, making quality backlinks), you become master in SEO. Ans 1: Moving forward, I think there will be two most important ranking factors. Authority (aka links) and topical expertise. Establishing an authoritative brand around your blog or business is really necessary to get the first hand in SERPs. You need links, from authoritative sites, which show you have something credible and noteworthy to offer. Don’t go by my word, here is the latest research that shows links are important ranking factors. Ans 2: Having said that, your link acquisition strategy also plays a major role on how Google sees your site. The same research above shows that relevancy and authority of the linking pages also matter. Here are some quality examples of backlinks you should go after to give your authority a boost. Ans 3: The next factor is topical expertise. Google is shifting from a keyword only strategy to a topic based strategy. You need to be an expert about the topic you are writing about. Out of two sites ranking for the same term, Google now gives priority to the one that has more topical breadth (or has written more about the topic) than the one that has just one article on the topic targeting to rank for that keyword. It makes sense from a good user experience point of view too. Ans 1: High-Quality content is going to be the most significant ranking factor in 2019. As the Google RankBrain algorithm works according to the visitors’ satisfaction, your valuable piece of content helps you rank higher on search engine page results. Website loading speed will also be considered as one of the primary ranking factors of Google because of the extreme impatience of the readers who look for the instant information. Ans 2: As I said earlier, the exceptional optimized content that matches the user search intent would dominate the other SEO predictions like Voice search, Website Speed, Mobile-friendly and so on. Ans 3: High-grade content with relevant internal links works like a charm for me. The internal linking improves the topical authority and hence we can rank higher for the targeted keywords. I always prefer crafting in-depth articles with inbound links to offer the solution to my readers’ problems. Ans 1: The most important ranking factor for 2019 is writing good quality content and keeping your website updated with fresh quality content via your news stories, hints and tips, and your blog. Using your social media outlets to share it will also help you earn valuable and relevant link equity. Ans 2: Semantics are the next big thing in 2019 for SEO. Semantic searches look at relationships between a search term and then goes on to find related relevant content. They look at words and phrases that help search engines determine the context of the content and determine how well it fits the intended query by the user. Ans 3: Onsite optimisation is still an important ranking factor in SEO, and if you get it right you can gain some real wins. “Alt” tags are still important for the search engines to help better understand what your site is about. Always add your branded name and your keywords wherever possible when tagging your images. The search engines will find it a lot easier to rank your images if you label them correctly. Ans 1: User experience on the website is going to the major factor because Google is implementing AI in its algorithms. It’s gonna be hard for the scammers to trick Google. Ans 2: Backlinks would still work but the relevance would take the lead. Infact, most of the websites with fewer backlinks but high relevance are already ranking. If the content is satisfying the user intent then the reader gonna spend more time on the website and read more pages per session. That behaviour would send a signal to Google to send more such readers on the website from the next time. Ans 3: Picking the right niche and writing excellent content worked like a charm so far. Last year I experimented with websites on the expired domain (to leverage the existing authority of the domain) but the results are not out yet. It will take some time to say with confidence that ranking on the expired domain is easy than a new domain. So far we are publishing in-depth niche reports for bloggers so that they can pick the profitable niche from the first day. So far quality content is working for to get SEO ranking and we are determined to repeat what works. Ans 2: In 2019, optimizing your site for voice search and the featured snippets should be an essential part of your SEO strategy. Go fully white-hat. With all Google’s algorithm updates, it’s increasingly more dangerous to use PBNs and other black hat techniques. Although such methods may provide quick results for your clients, in the long-term it’s a bad choice and may get your site (or your client’s sites) penalized. It simply not worth the risk. Ans 3: For me, the best link building strategy is to get media features. I’ve been featured in podcasts, interviews and lots of expert roundups. It’s also an excellent opportunity to build valuable relationships which can also result in backlinks as I mentioned above. 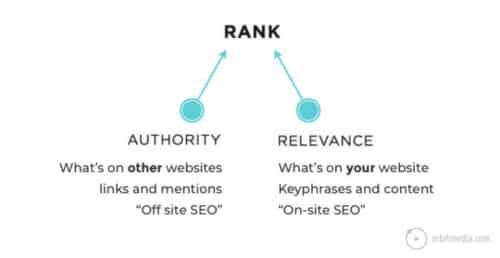 Ans 1: In SEO, Content is king & Backlinks are the queen. The whole game of SEO was in hand of queen till now ( Obviously 🤣 ). But in 2019, I suggest focusing more on content as well. As Google is heavily focusing on Knowledge graph and snippets, they are literally killing blog traffic for one line answers. So, I suggest staying away from such articles and focus on topics, which need a detailed explanation. And about backlinks, no matter how much smart Google works, I don’t think they can ever beat blackhat SEO. But yes, if you’re in blackhat, stop using outdated techniques shared on the internet, and be innovative. Ans 2: As everyone knows, Google is increasing dependency on Artificial Intelligence. So, it’s sure that they will increase their focus on content relevancy & other things, which can help users get the best answer easily. Till now, Google was highly dependent on metrics like Number of keywords, number of backlinks and so on, but now it’s going to change rapidly. Now their systems are capable read and understand text/images. So, I think 2019-20 will be focused on user experience as a major ranking factor for SEO. Ans 3: Just one thing, Never underestimate the power of Influencers in SEO or Marketing. With help of few influencers, I was able to push huge traffic on a client website, and after a week we thought it’s over. Because the post shared by our influencers was almost outdated now. But we have seen that Google increased our website crawling rate, and improved our ranking suddenly, thanks to that heavy traffic flow and shares from a few popular influencers on Twitter & Facebook. We didn’t expect any SEO benefit from influencer branding ( Not at this level surely ), but it surely works like crazy. Ans 1: If I were to pick one and put it in a term, the more accurate would be the page’s trust factor. And by the trust as a ranking factor, it will be the mixture of audience-first content being served, the user’s experience of the page, dwell time, social love, quantity + quality of referring domains and backlinks towards the page. I believe this is the thing you should consider in order to rank your page in 2019. Ans 2: Google will continue to raise the quality bar for sites to be included in the first page. This move will ignite website owners to present smarter information that matches the search intent of their users. As a result, searchers will be more satisfied since the competing pages would offer richer content in order for them to be placed in higher ranking spots, featured snippets or people also ask boxes. Ans 3: My friend Carl and I were exploring new things in local SEO to see what works and what doesn’t nowadays. 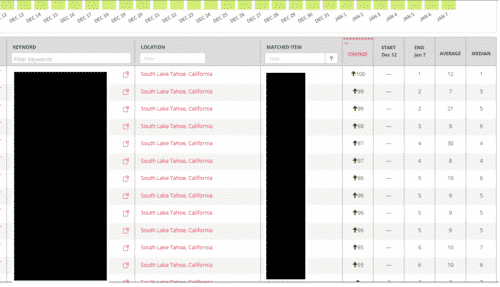 One of the most notable experiments we had was about hacking the ranking in snack packs and Google Local Finder by adding keyword and location inside the GMB listing instead of putting in the business name only. A simple alteration in your listing could result in massive ranking spikes like this. This particular strategy worked well for a local business with multiple locations. If you want to learn more about the entire process and case study, feel free to check it out. Ans 1: With the emphasis on improving user experience, especially on mobile, Page speed is going to be the most important ranking factor in 2019. One of the reasons for a higher bounce rate is poor page speed and load time. Thus, page speed optimization is important and the benefits you can garner from it are; better user experience, leading to increased dwell time, lower bounce rate and higher rankings. Ans 2: With an increase in the level of mobile device usage, the total Mobile traffic will rise by 90% in 2019. As such, marketers and business owners need to optimize their website for mobile search if they want to keep pace with the changing market trends or else stand to lose a huge chunk of potential traffic to their competitors. Ans 3: AMP Pages are here to stay. If you’ve not implemented it, then its high time you do as it has an impact on all your marketing campaigns. It can help deliver enhanced user experience, drive more traffic and increase your revenue. Create content that readers want. Get involvement from real human readers that will naturally visit more, share with others and create a real buzz around your site. Ans 2: Boring content written for search engine bots and trying to trick Google is out. The best advice is still what I learned in the 1990’s. Ans 3: Create content that will be valuable 5-10 years from now. Pay attention to search without falling for the fads. Anything you create for the current fads will be a time you could have used truly building awesome content and real relationships. Ans 1: This is one that needs answering with a bit of a caveat, as we all know that there’s no one thing SEOs and site owners can do on its own that will bring ranking success, but there’s no doubt that some factors can move the needle more than others. If we’re talking about what Google will look at most in order to decide what to rank a site for, this is going to be more and more about what’s on the pages of a site, how it’s ‘themed’, and the relevance and quality of this content for specific search intent. Ans 2: If we’re talking about what would be the most important factor that enables a correctly-themed, well-optimised site to rank well, then that has to be links…still – although the relevance and quality of these links is key. There are the likely predictions for 2019, such as optimising for the growing volume of mobile and voice searches, as well as focusing pages and sites more specifically for search intent, but I think these come under the bigger umbrella of where search is heading, and that is taking a more quality-focused approach. Ans 3: I don’t think SEO is getting harder, probably the opposite in fact as the playing field gets levelled, but ranking well over the long term is going to require a focus on the quality of the work that goes into all the different aspects of optimisation. It’s no surprise that you see far fewer ‘top secret ranking loopholes’ these days, and it’s because they don’t work/last, and the only way to get success for clients is by doing the right things well. The importance of keywords in domains seems to have come full circle. Whereas EMDs were hot property a few years ago and then seemed to fall foul of Google as they were spammed to death, having your keyword in your domain as part of a brand really works – especially for local searches. Hola! 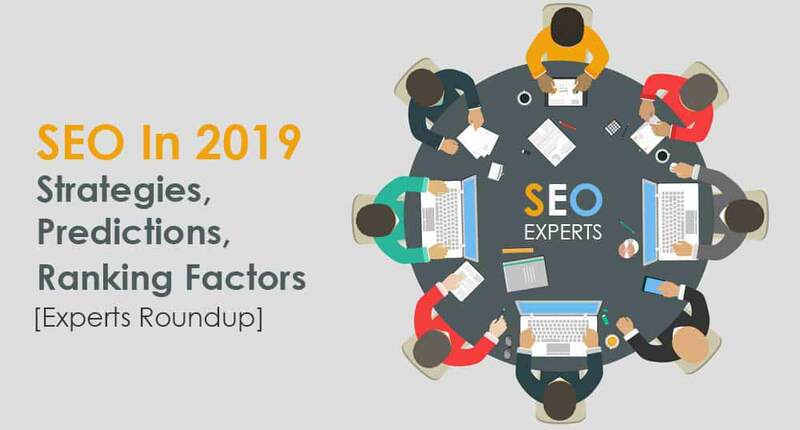 you just finished reading top opinions of leading SEO’s on Google ranking factors, SEO predictions for 2019, SEO strategies working for SEO experts. We would love to hear what you think about their answers. Let us know your views in the comment box!